It seems Planned Parenthood is under fire on an almost daily basis. I was forwarded an email from Lindsay Maas, a field organizer with Planned Parenthood Affiliates of Michigan and Planned Parenthood Advocates of Michigan concerning "an article highlighting local opposition to the new Planned Parenthood health center in Auburn Hills (Mich.)" The article was supposed to appear in today's edition of The Oakland Press, according to Maas. I have not yet seen the article published on the newspaper's website, its Facebook page or in today's print edition. It is unclear from the email whether this was to be a news article or an opinion/editorial piece. Maas is asking for support for Planned Parenthood in the form of letters and emails to the editor, when and if the article runs, as well as a presence at the Auburn Hills City Council meeting on Monday, May 16 to "to speak directly to the Council concerning the importance of providing family planning services in the area." "In 2010, Planned Parenthood served 5,420 Oakland County residents, most of whom were uninsured and had no ability to pay. However, these patients of course had to visit one of our neighboring health centers as their (sic) is currently no provider in Oakland County that serves low income men, women, and teens regardless of their ability to pay. Oakland County is losing federal funds that would be available to provide much needed family planning services to area residents. Planned Parenthood, America's most trusted reproductive health care provider, could fill this void and bring quality, affordable family planning services to Oakland County residents." And she's correct. All of Michigan's 19 Planned Parenthood Clinics are outside Oakland County. They are located in Ann Arbor, Battle Creek, Benton Harbor, Big Rapids, Brighton, Barton, Coldwater, Detroit, East Lansing, Flint, Grand Rapids, Ionia, Jackson, Kalamazoo, Lansing, Livonia, Marquette, Muskegon and Owosso. In an accompanying email, Kimberly Beebe, president of the Oakland Country chapter of NOW (National Organization for Women) says, "(the health center) is not even under construction yet. It also has not been determined if abortions will be provided at this location - FYI abortion is only 3% of the services provided by PP, the remaining 97% is family planning and much needed testing and health care services." 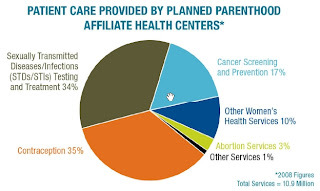 This is the same graphic used by Stephen Colbert when he refuted remarks made by Arizona senator Jon Kyl and presented the facts about Planned Parenthood's services. YES, Planned Parenthood is not all about abortion, but also about selling baby body parts for profit.